Our product range includes a wide range of is - 112 789 weatherseal silicone sealant, is - 114 neutral plus silicone sealant, is - 112 weatherseal silicone sealant 789 sausage, is - 121 acrylic paintable sealant, is - 113 995 structural glazing silicone sealant and is - 111 general purpose silicone sealant. We are a trustyworthy organization offering a wide a gamut of IS - 112 789 Weatherseal Silicone Sealant. 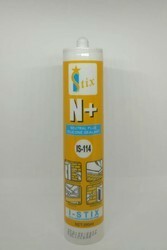 We are a trustyworthy organization offering a wide a gamut of IS - 114 Neutral Plus Silicone Sealant. We are a trustyworthy organization offering a wide a gamut of IS - 112 Weatherseal Silicone Sealant 789 Sausage. We are a trustyworthy organization offering a wide a gamut of IS - 121 Acrylic Paintable Sealant. We are a trustyworthy organization offering a wide a gamut of IS - 113 995 Structural Glazing Silicone Sealant. We are a trustyworthy organization offering a wide a gamut of IS - 111 General Purpose Silicone Sealant.